511 Tactical 502679991SZ Active Patrol Kit (50267) FREE SHIPPING! The Active Patrol Breaching Kit by 5.11 Tactical (model no. 50267) is specially designed for emergency service and law enforcement personnel who need a quick force entry into a building, room or vehicle. 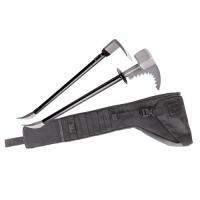 This kit features two essential tools: MultiPry and MultiSledge. Combined, these tools offer quick and efficient emergency entry through standard doors, security doors and safety glass. The 28 inch MultiPry is a seamless hydraulic pipe with drop-forged, fully hardened steel alloy tool heads. It has a forked pry bar on one end and a thick duckbill head with serrated edge on the other. There is also a hand guard to prevent accidental slippage. The 27 inch MultiSledge also has a seamless design with drop forged, hardened steel heads. On one end is a convex impact area for focused impact and, on the other end, there is a hard rake for busting, raking and clearing obstructions. Both also feature welded sling attachment points. The tools fit in the included sling bag, which makes it easy to store and grab when needed from a department locker or car trunk. NOTE: This item is restricted to law enforcement and military personnel only. Confirmation is required prior to purchase. ©2002-2019 CopsPlus.com: 511 Tactical 502679991SZ Active Patrol Kit (50267) FREE SHIPPING!